Game description: Cats lived peacefully on their large tree until the emperor Shun, king of the gorillas, invaded their village. 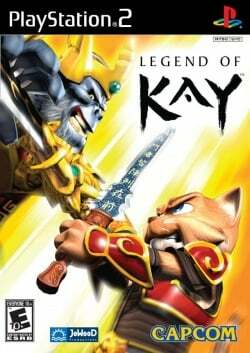 Kay, a young cat trained in martial arts, steps up to the challenges of protecting his village and finding his father. As Kay, you'll experience close-combat fighting while improving your fighting skills, acquiring new weapons and powers, and discovering secrets. The worlds, which include woods, swamps, caves, and more, re-create the look and feel of classic martial arts movies. Legend of Kay is a classic action adventure – enhanced by an advanced close combat fighting system. Our hero ‘Kay’, a young cat Kay, embarks on a quest to save his village from invading troops of emperor Shun – king of the mighty gorillas. Kay may be young, but he is a brave and agile fighter. He leaves his hometown only with his sword and soon becomes a seasoned fighter, the only hope of all cats. Finally Kay will manage to unravel the secret that lies hidden in the volcano fortress of emperor Shun. The fights in Legend of Kay recreate the feeling of classic eastern martial-arts-movies. But even Kay’s most spectecular moves are executed by pressing few buttons at the right moment. Kay auto-aims at enemies to a certain extent, which makes it easy for the player to execute double- and triple blows, uppercuts, backflips, somersaults and powerful magic attacks. This page was last edited on 26 December 2016, at 17:39.